Sika officials at the opening of the new production facility in Dubai. 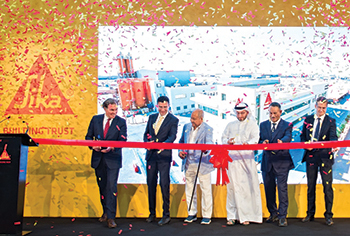 Sika, a global leader in chemicals and building materials, has officially inaugurated its state-of-the-art production facility along with the offices in Dubai as part of its regional expansion strategy. With a 240,000-tonne annual production capacity, the new facility will allow the production of high-performance concrete admixtures and will play a strategic role as a key sales and distribution centre for the region, said the Swiss company. The factory, located at Dubai Industrial Park, has been built at a total investment of around Dh40 million ($10.8 million). It is also designed to ensure a high level of productivity and quality consistency through a fully automated system and an advanced technical training centre. The official opening ceremony was held in the presence of senior company officials including Ivo Schädler, the regional manager for Europe, Middle East and Africa (EMEA), Abdullaziz Zaidan, the chairman of Sika (Arabia), Saud Abu Al Shawareb, the managing director of Dubai Industrial Park and Chris Watts, consul general of Switzerland.